This year’s NewCities Summit is slated to kick off at the coastal city of Songdo in South Korea on Wednesday, with an aim to contribute to improving life in cities around the world through innovation and help Incheon City rise into a global smart city development leader. The Incheon Free Economic Zone Authority said that it will host the NewCities Summit 2017 from June 7-9 at the Songdo Convensia Convention Center located the Songdo International Business District. The theme of this year’s NewCities Summit is “Thriving Cities: The Building Blocks of Urban Wellbeing.” The three-day event will involve on-site city tours as well as presentations, panel talks, roundtable discussions and workshops on topics like understanding urban wellbeing, digitalizing new city development as well as eco-friendly urban design. Co-hosted by the IFEZ and the Geneva-based NewCities Foundation, the event is slated to bring together more than 800 smart city experts, politicians, scholars and entrepreneurs from more than 50 countries to discuss smart city planning agendas and forge new business opportunities. The upcoming Songdo summit is in its sixth running. The NewCities Foundation has been hosting the annual event with various cities around the world, starting with Paris in 2012. Jakarta was the first Asian city to host the event in 2015. According to organizers, this year’s summit participants will propose what a city needs in order to provide the best quality of life for the people, envision a future city that prioritize people’s well-being and lay out ways to make use of smart city technologies to maximize urban wellbeing. “The NewCities Summit 2017 will become a platform for the IFEZ to become a global leader in smart city trends and innovative urban technology platforms,” said IFEZ Commissioner Lee Young-geun. 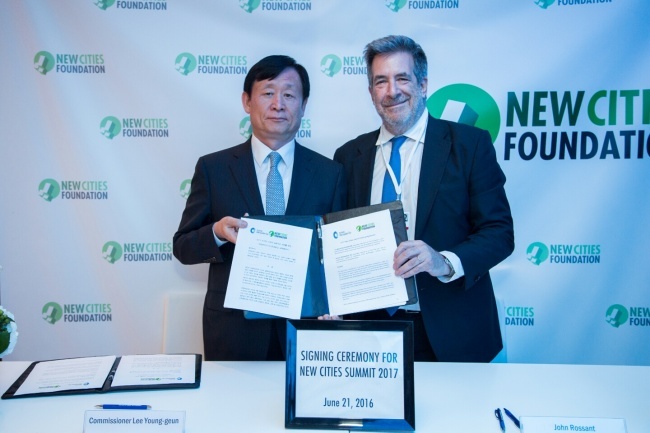 Following a series of on-site smart city tours Wednesday, the summit’s session will officially kick off on Thursday with a welcoming speech from NewCities Foundation Chairman John Rossant and Incheon City Mayor Yoo Jeong-bok. The discussion will feature distinguished guests including the World Bank’s Director of Social, Urban, Rural and Resilience Global Practice Ede Ijjasz-Vasquez and Bethlehem Municipality Mayor Vera Baboun. CNN International Correspondent Paula Hancocks is slated to moderate the session. The founders of global social enterprises and mobility startups including Small Change and WhereIsMyTransport will also share how they are capitalizing on modern technology to tackle the biggest urban challenges of our time. Global corporations and environmental groups will come together to discuss ways to measure “urban wellbeing” and to define the types of global or regional standards that must be enforced to keep cities healthy. This panel session will invite Intel’s Vice President and General Manager of Internet of Things Jonathan Ballon, Executive Director of the Green Climate Fund Howard Bamsey and US Green Building Council President Mahesh Ramanujam. 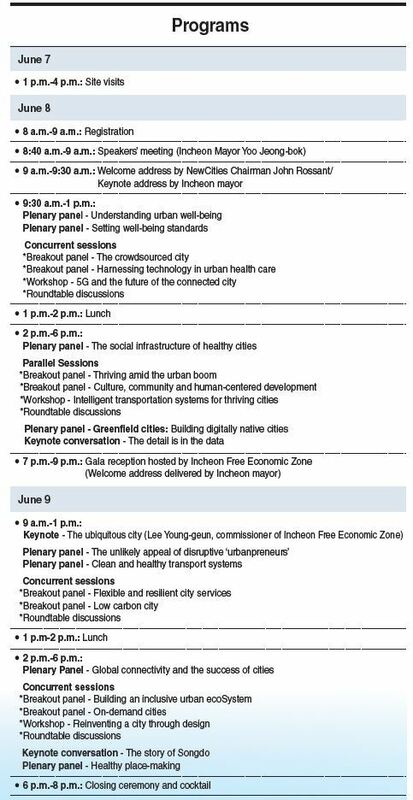 Other topics to be discussed on Thursday include crowdsourcing campaigns for urban development, harnessing technology in urban healthcare, creating connected cities via 5G network technologies and building intelligent transportation systems, among others. Another session will revolve around the development of “clean and healthy transport systems,” inviting Uber’s Asia Policy Lead Priscilla Baek, William Chernicoff, Senior Manager of Global Research & Innovation at the Toyota Mobility Foundation and other industry figures to the table. English and Korean translation services will be available during the event. For registration and further information about the NewCities Summit 2017, visit www.newcitiessumit2017.org.